© 2018 Mercedes-Benz Canada Inc. *0.9% financing only available through Mercedes-Benz Financial Services on approved credit for a limited time. Available for 60 month finance on model year 2016 C 300 Sedan and 2016-2017 GLC 300 Mercedes-Benz Certified Pre-Owned models, excluding AMG (less than 140,000 km) / 2015-2018 Mercedes-Benz Certified Pre-Owned models, excluding AMG, 2016 C 300 and 2016-2017 GLC 300 models (less than 140,000 km). **2.90% financing only available through Mercedes-Benz Financial Services on approved credit for a limited time. Available for 24 month finance on model year 2015-2018 Mercedes-Benz Certified Pre-Owned AMG models (less than 140,000 km). Down payment may be required. Dealer may lease or finance for less. Factory Warranty coverage is applicable for a period of (a) 48 months from the initial registration date of the vehicle or (b) until the said vehicle reaches 80,000 kilometres, whichever occurs first. 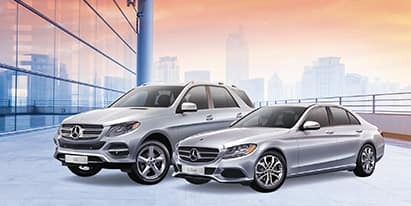 **First, second and third months payments are waived for finance programs on model year 2014-2017 Mercedes-Benz Certified Pre-Owned models (excluding AMG). The payment waivers are capped up to a total of $500/month, including tax, for a Mercedes-Benz model. Vehicle licence, insurance, registration and sales taxes are extra. Mercedes-Benz Star Certified Pre-Owned Limited Warranty coverage is applicable for a period of (a) 24 months from the date of expiration of the Factory Warranty or (b) until the said vehicle reaches 120,000 total accumulated kilometres from the date of manufacturing of the vehicle, whichever occurs first. Repairs covered by the Mercedes-Benz Star Certified Pre-Owned Limited Warranty are subject to a $50 service charge per repair visit. If, under the Factory Warranty the vehicle reaches 80,000 total accumulated kilometres prior to the expiration of 48 months from the date of manufacturing of the vehicle, the Mercedes-Benz Star Certified Pre-Owned Limited Warranty coverage will begin with the repair order date of the first claim submitted over 80,000 kilometres. See dealership for complete details. 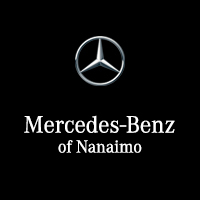 Offers from Mercedes-Benz Nanaimo, see dealership for complete details and restrictions. Dealer may lease or finance for less. Offer may change without notice and cannot be combined with any other offers. Prices subject to change based on live market pricing. Offers end April 30th, 2019, 2018. See Mercedes-Benz Nanaimo for details. DL9808 #30818.